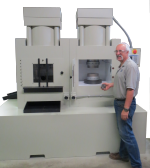 Upset Testing is the quickest and best way of detecting near surface flaws in hot rolled product. The test is quick and easy so it can be done right on the mill floor and the results of the test can be acted on immediately to minimize scrap. A small sample of each coil produced is taken to the Vale Upset Tester where it is automatically sheared in the Shear Portion of the system to the correct length in relation to the sample diameter. Depending on the standard used, the length will be 1.5 times the diameter (DIN) or 1.3 times the diameter (USA). The correctly sheared sample slug is automatically returned to the operator who then places it in the Upset Portion of the system. 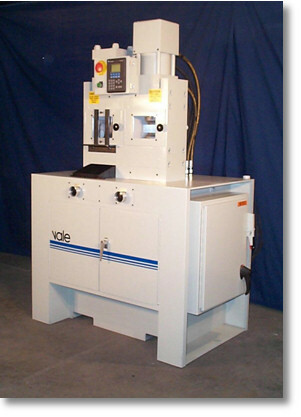 The upset portion for the Vale Upset Tester is adjustable so that the sample slug can be upset or reduced in height by whatever amount you desire (with a high degree of accuracy and repeatability). A common reduction is 50% of the height, but if you are testing harder material the upset will be a smaller percentage and for the softer materials you may want to upset the sample slug more than 50%. When the sample slug is upset or reduced in height, the metal must flow and if there are flaws in the rod or bar, they will show up as splits along the edge of the upset sample. The operator visually inspects the upset sample to detect any splits and if any are found he can immediately notify your production manager so that steps can be taken to rectify the situation. Upset Testers are available in six (6) different sizes and the unit best for your facility depends on the diameters of material you will be testing and their ultimate tensile strengths. For more details on upset testing and to be able to quickly calculate the size best suited to your need, please review our Upset Tester Demo and when you get to the “Selecting an Upset Tester” click on “Calculate” which will open the window where you can input your data to determine the size of the Upset Tester you need. For detailed unit specifications please refer to catalog page 191. You can also see a short video of an Upset Tester in action. Ideal for cutting small diameter wires, hard or soft.